Having invested in the some of the latest gutter cleaning equipment available, we operate a Gutter Vac Omnipole that enables us to clear gutters at a significant height. This innovate and telescopic system allows the operator to clear debris from the gutter at ground level, alleviating the need for access equipment or expensive scaffolding. It can also detect signs of general “wear and tear” and other damage that may have be caused to the guttering. Here at aquablast we use the latest technology in gutter vaccum’s which allows the cleaning of gutters from the ground floor, no ladders needed or scaffolding. 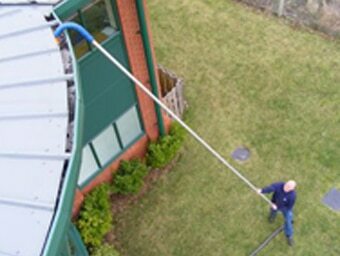 Aquablast gutter cleaning, hard to reach areas with our Gutter vacuum system. Capable of reaching 2-3 Storeys without the need of scaffolding or ladders, we welcome all enquiries commercial and domestic as we can reach up to 3 storeys high. We can also use cherry picker services should you need for any gutters higher than 3 storey’s.